As you start searching for the best pillow for side sleeper reviews, it will not take long before you realize that the options are abundant. For the impatient and ignorant buyer, it is easy to decide by which one is the cheapest or which one is seen first. However, it is important to always assume the role of a responsible buyer, and hence, you should take a time to do your research. 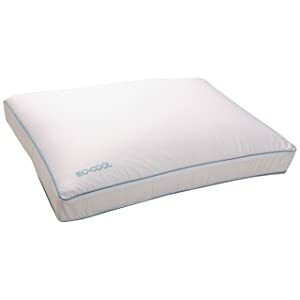 With this, as you look for the best, consider Sleep Better Iso-Cool Memory Foam Pillow as an option, with three different options including contour, standard and traditional shape. Outlast Adaptive Comfort Material: This is perhaps one of the reasons why it is ranked as amongst the best within the product category. This technology incorporates the use of Phase Change Material. The main purpose of the latter is to detect the temperature of the body. In return, the pillow will adjust to help in the regulation of body temperature. 100% Cotton Cover: This is a material that is common in most pillow covers. The best thing about this pillow is perhaps its breathability, which adds up to the comfort that can be provided by the pillow. It is also natural, and hence, hypoallergenic. Gusseted Design: This feature allows the pillow to deliver the highest level of comfort for its users. Because it is gusseted, it means that the loft is elevated. This level is maintained all throughout your sleep, providing your head with the support that you need, which is critical if you are sleeping on your side. Visco-Elastic Memory Foam Filling: The memory foam that is used in this pillow allows it to provide customized shape based on your needs. It offers maximum support for the head neck, shoulders, and back. Regulates Body Temperature: As if the pillow has a mind of its own, it can detect your body temperature. In turn, the pillow will adjust to your temperature, which is going to be vital for your comfort. Easy to Clean: It is also a good thing that this pillow is machine-washable, which will make it effortless for you to maintain its best quality, even through the years. Highly Dense: This is a significant advantage of the pillow as it makes it supportive. The material density provides the support that is needed by the weight of the user, especially for side sleepers. Hypoallergenic: If you frequently suffer from allergies, this is the right pillow for you. It has a 300-thread count cotton cover that is not only soft but can also resist common allergens. Can be Too High: Earlier, we have noted that the density of this pillow is an advantage because of the support that it provides. However, in the same way, it can also be a downside. This is basically because it can make the pillow too high, which can cause discomfort for some. Musty Smell: The annoying odor is a result of the packaging. It is commonly experienced a few days after the pillow is opened. It won’t take long, however, before this smell disappears without the need to do anything. In sum, Sleep Better Iso-Cool Memory Foam Pillow with king size may be a bit high and can have a musty odor on the first few days of its use, but when you take a look at its benefits, you will quickly realize that the pros outweigh the cons. The best thing about this product is perhaps its ability to regulate body temperature, providing you with the assurance of your comfort in spite of the external conditions. For this reason, it will make an excellent choice for the pillows for side sleepers.